Air dampers can be used to balance HVAC systems in your home and office. My friend suggested that my HVAC system needs to be ‘balanced.’ What does this mean, and why might I need this? Most residential and commercial heating, ventilation and air conditioning systems rely on a series of ducts to transport air through a house. In a properly functioning HVAC system, lots of different things are happening in sync. The heat pump is operating smoothly, air is moving cleanly and the dampers are allowing a certain amount of air to each vent. But the single most important part of any HVAC system’s smooth operation is making sure the appropriate amount of air is reaching different rooms. This involves adjusting dampers and measuring air throughput to ensure one area is not staying toasty warm while another is cold. This act of adjusting an HVAC system for proper airflow delivery is known as balancing the system. In this article, we will discuss why balancing an HVAC system is so important, why systems become unbalanced, what the balancing process entails and more. This crucial piece of the puzzle allows your system to do its job properly, delivering the right amount of air to different parts of the building. Let’s first take a look at what it means to balance an HVAC system exactly. What Does It Mean to Balance an HVAC System? First off, balancing only needs to be done on systems that utilize ductwork. This is because ducts distribute air throughout a structure, and the resistance to airflow is the only thing that determines how much air reaches each room. In systems that do not use ducts, such as radiant floor systems, ductless HVAC systems, and window air conditioning units, balancing is not necessary. Air is a fluid, meaning it takes the shape of its container. When air exits the blower and enters the supply ducts, it will naturally follow the path of least resistance. Balancing an HVAC system means managing this resistance to guide air in the proper direction. What Is an Example of a System in Need of Balancing? As an example, picture a small, four-room house with an HVAC system. There is a single duct coming off of the blower that quickly splits in two, one carrying air upstairs and the other carrying air downstairs. Both the downstairs and upstairs ducts split in two as well. Our imaginary system has some challenges, though. Downstairs, one duct only has to travel five feet before meeting the foyer, while the other has to travel 15 feet to the kitchen. Upstairs, the ducts service a large family room and a single small bedroom. Immediately, the problem is this: The air coming out of the blower naturally wants to flow into the foyer. There is very little resistance because the distance is short, and there are few turns in the ductwork. We solve this problem by adding resistance to the air entering the foyer. This is accomplished through the use of a damper, which takes the form of a disc in circular ducts, and a series of adjustable flaps in square ducts. These can range from fully closed to fully open, or 100 percent resistance to roughly zero percent resistance, respectively. In our example house, balancing the HVAC system would entail manipulating these dampers to encourage air to flow to other parts of the house. This would be accomplished by restricting airflow via the damper in the foyer. This would create resistance in this particular outlet, causing the air to seek other outlets with less resistance. Upstairs, we might also restrict the damper on the small bedroom to encourage more air to reach the larger living room. It’s worth noting that some buildings simply have areas with very different heating or cooling needs from the rest of the home. In this case, basic balancing alone would not be enough. If the family room in our imaginary house is south-facing and has wall-to-wall windows, it might need even more cooling than balancing can supply, and a second zoning solution may be required. The goal of any HVAC technician is to provide comfort to building occupants so the last thing on any homeowner’s mind is their HVAC system. How Can a System Become Unbalanced? Generally, balancing is something that happens once and then doesn’t need to be fiddled with again. It is usually the last step in an HVAC system installation. Why, then, would a system need to be balanced if it is not new? The answer is that parts wear and room setups change. For starters, the dampers in your ducts may wear down or shift over time, leading to an uneven airflow. Additionally, rooms may receive large pieces of furniture that reduce the volume of air needed to heat the space. Computers or machinery can also heat an area and necessitate less heating. Certain doors may become more or less popular as entryways, creating a net loss of heat in that particular area. Note that when a system is unbalanced, you are burning extra energy and lowering your home’s efficiency. Heat is being pumped excessively into some rooms and not enough into others. It is important to fix this type of problem to avoid accumulating excessive energy bills. How Often Should Systems Be Balanced? Systems need to be balanced when they are first installed. Provided this is done properly, they should not require balancing again unless a problem occurs. Detecting such a problem in your HVAC system is as easy as checking the temperature of different rooms on a hot or cold day. If a certain room is too warm or cool, this most likely indicates a problem. If you are lucky, your HVAC system may only need to be balanced once in its lifetime. However, don’t count on this — a lot of factors can change in a house, and there is a chance you will need to adjust your system’s balance after several years. Balancing an HVAC system involves technical equipment, tools, and a strategy. Because it has such a huge impact on the comfort and energy efficiency of your home, it is important to have it done by a professional. This gives the best chance of it being a “once and done” type of affair. 1. Gather information on the building’s design. Technicians first need to understand where the air is coming from and what ductwork is involved. If possible, a schematic or blueprint of the HVAC system will be helpful to plan out the balancing process. Often, however, such documents are not available, and technicians must reverse-engineer the balance. This reverse-engineering starts with gathering the models and part numbers of the components in the HVAC system. Using these, they calculate the output and derive the total airflow that the system requires. They then divide this total airflow by the number of rooms, though this estimation is subject to some finer details and techniques. These include accounting for room size, air changes and other factors detailed in technical manuals. The external static pressure rating of the fan, the horsepower of the blower motor and other pieces of information will also tie into the balance report. Technicians will use this data to compare predictions to actual measurements taken. Once they have collected the necessary data, the technician will sketch a floor plan of the house and determine the best order in which to test the different supply registers. Often, they will begin with the room farthest away from the blower. They will also mark the return grilles so that they know how air is returning to the system. 2. Give the system an inspection and turn it on. Because most systems get very few full inspections through their lifetimes, it is important for technicians to personally inspect as much of your system as they can. This allows them to make any necessary repairs. Certain problems like disconnections, loose dampers, crushed ducts and a lack of suspension can affect the overall system drastically. This gives technicians a chance to write down nameplate data, check the condition of filters and confirm the horsepower and speed of the fan. Then the technician turns the system on to either heating or cooling mode. The first step after doing so is to drill test ports on either side of the blower apparatus, with an additional port several feet after the cooling equipment. This provides points at which they can measure both temperature and static pressure. 3. Test the Initial Airflow. Technicians use what is known as a balancing hood to gain accurate readings of airflow from different supply registers. Essentially, this tool allows them to isolate the air coming out of particular vents to ascertain its output. The benefit of a commercial balancing hood is that it provides accuracy while allowing the air to flow as it normally would into a room. Other methods cause pressure buildup and give an unrealistic readout of air pressure. The next step is to find how much air is being taken in via the return grilles. Technicians add the total volume of air flowing into the return grilles, then add together the total amount of air coming out of the supply registers. 4. Look at the Design vs. the Recorded Measurements. The technician then compares the measured airflow they have taken for the different parts of the system with the initial predictions based on the design. If the cubic feet per minute moving through the system is higher or lower than required, they adjust the fan accordingly. The goal is to bring the supply registers to within 10 percent of the ideal system airflow. If certain supply or return grilles are more than 10 percent above the design specification, dampers should be closed to hinder airflow. This will have another effect — it will increase airflow in registers that were too low. A technician will do this repeatedly until all supply registers and return grilles are operating within 10 percent of their design specs. The final step is a walkthrough to double-check airflow and to record the settings of the dampers for use in diagnosing future problems. How Long Does It Take a Technician to Balance a System? There is no real way to state a useful number here, as the time required for a technician to perform a proper balance depends on the size of the building and the age, complexity and state of the system. Typically, two technicians will work together to efficiently perform adjustments. This allows one to adjust the fan while another performs readings in real time. Your technician should be able to give you an estimate of time after looking at your system. How Is Balancing Different From Routine HVAC Maintenance? As you can gather from the preceding steps, balancing is an involved procedure. It allows technicians to determine optimal configuration settings and work to achieve them. This normally happens just once in an HVAC system’s life, but it sometimes needs to be performed again after the system has aged. HVAC maintenance, on the other hand, gets performed regularly. It includes replacement or repair of worn-out parts, inspection for air quality, filter replacement and upkeep of mechanical componentry. This can be thought of as preventive maintenance, as it is done to prevent your system from breaking down when you need it most. These visits typically happen a minimum of two times per year. Should a Homeowner Balance Their System on Their Own? There are plenty of DIY tasks that homeowners can tackle to save money. However, balancing an HVAC system is one best left to professionals. A key reason is experience. 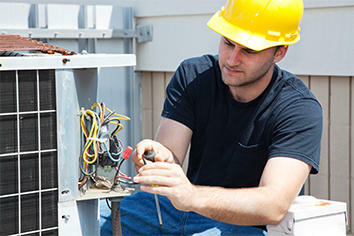 HVAC professionals deal with different systems regularly and are adept at identifying problems they have seen before. This experience means more expedient service and a more reliable outcome. It also means they can spot issues you may not be able to since they have performed balances on many other systems. One of the most important reasons this job should be performed by professionals is the equipment it requires. A commercial balancing hood alone costs several thousand dollars. HVAC professionals can spread the cost of this device out over many years of service, but it is prohibitively expensive for someone looking to do their own HVAC balance. Additionally, workaround methods deliver poor accuracy and can lead to improper balancing. To get your HVAC balanced properly, contact a professional and set up a time to get it done. Remember — if it is done properly, chances are it won’t need to be done again. Test the temperature in different rooms on days that are either hot or cold. Make note of changes that have occurred in a room, including large pieces of furniture, computers or machinery that may affect heating and cooling. Contact an HVAC specialist to balance your system, and try to locate any HVAC schematics or blueprints that will assist. The technician will begin by looking at the schematics or reverse-engineering an ideal airflow design. The next step is to inspect the entire system for leaks, disconnects, and damage. They will then turn the system on. Using drilled holes, they will test for static air pressure and temperature on either side of the blower. They will measure airflow on each supply register and return grille. Damper adjustments will allow them to modify airflow and create a system that works to within 10 percent of design specification. If you live in the Harrisburg, Carlisle, Chambersburg or York area, Tuckey is your local expert on HVAC-related matters. We provide exceptional service in installation, repair, balance, and other maintenance work. We offer Preventive Maintenance Programs in which customers can sign up for regular service. There are several benefits to this — the first being a set maintenance visit so that you don’t have to worry about keeping your system in good shape. The second is our waiving any “showing up” charge for emergency break down service. Finally, we offer discounts on parts, provide advance notice of sales and give you priority in our service dispatches. Contact Tuckey to keep your heating and cooling systems healthy and dependable.